The creation of art is something I have enjoyed my entire life. The process of creation for me begins with an initial concept or idea. My creativity is inspired by the world around me, most often by the marvels I encounter in nature and stories in sustainability. I will experiment with new mediums and techniques to achieve a desired look in a piece. In my furniture the medium can occasionally lead the narrative. I strive to find a balance between form and function, and pride myself in craftsmanship. Alex Schoeppner began woodworking at a young age. Growing up he assisted his father who owned a construction and custom cabinetry business. Here, Alex was taught the fundamentals in woodworking and craft. In 2004 Alex began to study at Iowa State University in Landscape Architecture and Integrated Studio Arts. Here Alex worked with many mediums and discovered his talent and love for the studio. 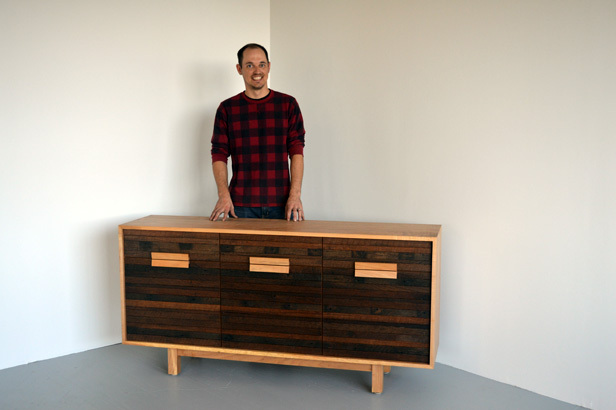 Alex stepped away from school in 2009 and started to design and build his own pieces. Much of his work from 2010-2016 was made from re-purposed oak barrels at his studio in Templeton, IA.